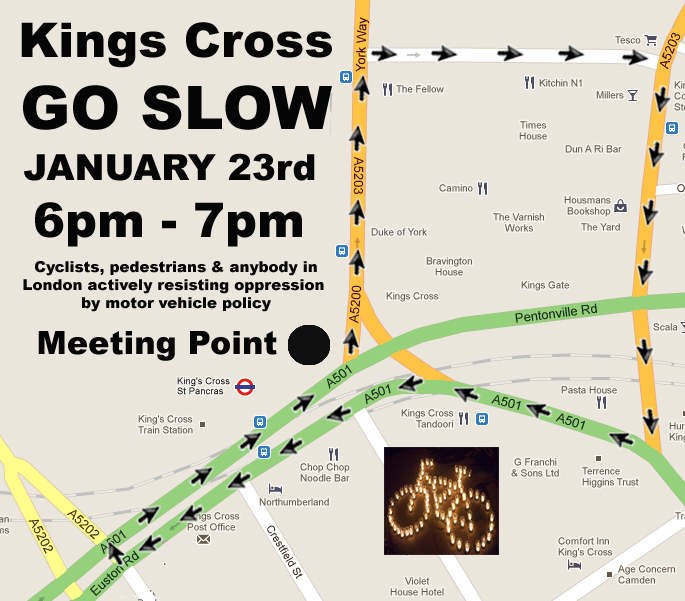 The Bikes Alive protest goes again at King's Cross today (Monday) at 6.00pm. It's for pedestrians, cyclists and animals. Peter Hendy, Commissioner for Transport for London, thinks the protest is "stupid". If you think it is his roads policies that are stupid, then join the demo, or a future one. Another tack on the politics of the roads is taken by another new organisation, Londoners on Bikes. They are asking all Londoners who use bikes to commit to voting in the mayoral elections on the cycling safety issue alone, as "transport is the one thing the Mayor really controls". The formation of an identifiable and substantial "cycling voting block", the theory goes, will influence the candidates' policies more than they have been influenced before by the diffuse cycling lobby. This goes along of course with London Cycling Campaign's Go Dutch mayoral election campaign, which will be formally launched on 9 February, asking that each mayoral candidate pledge to "Make London more liveable for everybody by making our streets as safe as inviting as they are in Holland" . So far there is little evidence of positive response to this from the current City Hall administration. TfL's proposed new designs for the killer Bow Roundabout are just more half-hearted concepts that bear no resemblance to anything that the Dutch would do in such a location, and do even less for pedestrians than for cyclists (nothing to be precise). I am not holding my breath that Boris Johnson's "step change in the way engineers think when planning for cyclists" (which is, suspiciously, a commitment we have not had from his lips, but only from those of his Director of Environment Kulveer Ranger) is going to amount to anything but more huff, quarter-measures, and refusal to confront the real issues of priority on the streets. We shall see. On a more positive note, the Cycling Embassy of Great Britain holds its Policy Bash this weekend, an intensive two-day workshop in London where cycle campaigners will cast a fresh look at those familiar questions, "What do we really need to make cycling a mass activity in the UK?" and "How can we best campaign to get it"? If you cannot be there, you can take part at a virtual level: use the hashtag #CEoGBBash to take part on Twitter. In addition, you are invited on the pre-Bash Infrastructure Safari, a two-hour cycle tour of good and not-so-good cycle infrastructure in central London, to inform the following days' discussions, which will start from Euston station at 6:15 pm on Friday.